In a highly consolidated vendor landscape, Everspin Technologies Inc. displays clear leadership in the global magneto resistive RAM market, finds Transparency Market Research (TMR) in a new report. The company held a share of more than 64% in the overall market in 2015. Some other key companies in the magneto resistive RAM market are Spin Transfer Technologies, Honeywell International, Avalanche Technology, and Toshiba. Product development and innovation are some of the key growth strategies that leading players were focused on so far. However, these companies are increasingly shifting focus towards strategic alliances and business partnerships to strengthen their position in this market. As per the TMR report, the global magneto resistive RAM market was valued at US$41.2 mn in 2015. Escalating at a CAGR of 44.20% between 2016 and 2024, the market is likely to be valued at US$869.7 mn by the end of 2024. Depending upon product, second-generation MRAM (STT-MRAM) with a share of close to 63% led the overall market in 2015. With the introduction of new product variants and significant demand for a host of applications, STT-MRAM segment is likely to continue to remain at the fore over the forecast period. 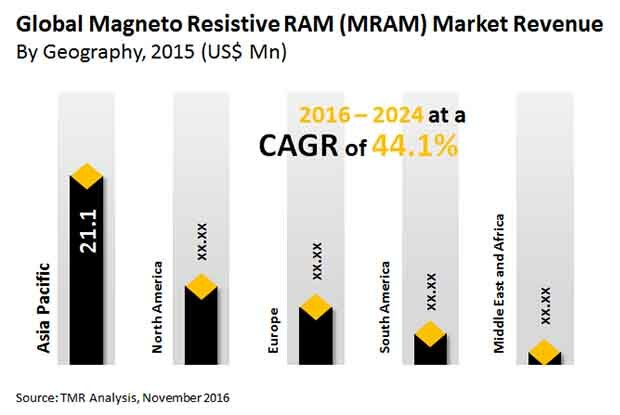 In terms of application, key segments into which the magneto resistive RAM market include enterprise storage, automotive, defense sectors, consumer electronics, and robotics. Among these, magneto resistive RAM finds most prominent application in the enterprise storage sector. Magneto resistive RAM helps improve networking and data center fault recovery systems in enterprise storage solutions. This helps reduce downtime, which in turn translates into increased productivity. This factor is likely to boost the adoption of magneto resistive RAM in the enterprise storage sector. Geography-wise, the key segments into which the magneto resistive RAM market is divided are North America, Europe, Asia Pacific, Latin America, and the Middle East and Africa. Asia Pacific, among these, displays the most prominent demand. This is mainly because of advancing data center infrastructure driven by increasing penetration of the Internet and growing popularity of cloud computing. “Globally, the demand for magneto resistive RAM is heavily influenced by the rising demand for highly scalable, power efficient, fast, and non-volatile memory devices with low cost per bit, especially in consumer electronics, enterprise storage, defense, and aerospace industries, says the author of this report. The enterprise storage industry is in expansion mode, thus stoking demand for magneto resistive RAM. Magneto resistive RAM displays massive cycling endurance and high speed reading/writing capabilities, which accounts for its widespread usage. At present, several consumer electronics applications use technologically advanced memory devices in order to attain reliability, low energy consumption, and data integrity. This is anticipated to present attractive opportunities for the global magneto resistive RAM market. Apart from this, growth of the flexible and wearable electronics market is also likely to have a positive impact on the sales of magneto resistive RAM devices over the forthcoming years. However, high cost of designing these devices, which eventually leads to increased cost of final product, is limiting their application.